To recall the medical incompetence, secrecy, cover-up and mendacity which was the rule rather than the exception where all sensitive matters concerning Sai Baba were mentioned, read this announcement about Sai Baba’s condition after he had been hospitalised in March 2011. Could one have been more mealy-mouthed, purposely misleading, delusional or laughably wrong? Sathya Sai Baba was admitted to the hospital in Puttaparthi which bears his name, according to one source with pneumonia, according to other sources in connection with a heart attack. Since 2005, Sathya Sai Baba used a special wheelchair because of a multiple hip fracture which was a botched operation. His last appearance in the temple (mandir) was on 22 November 2010. (Remarkable he was not present on 23rd – the date his birthday was celebrated). He last appeared in public March 25, 2011 three days before hospitalization. With expense no object, extra doctors were flown in from here and there by plane and helicopter, thousands of man-hours of work (which has shown no results comparable to the cost) and massive outlays in employing 5000 extra security police to protect the hospital, its staff and its environs. All this is tax exempt and all imports are duty-free, so a further burden is offloaded onto the public. The amount of time, energy and money that is being lavished by so incredibly many doctors – from India and abroad – is an affront to the majority of the populace most of which cannot afford one-thousandth of the treatment value Sathya Sai Baba is getting. At about that time, the Sai Central Trust “came out with a statement on Saturday that Baba was recovering fast and would be shifted to his own residence in about 15 days. A series of increasingly worried – but more realistic – reports from the doctors makes it appear that the great myth about Sai Baba living into his 90s, as he predicted – so his reason “I can finish My Task” – is about to be blown apart. The end is almost certainly closer and closer. The developing narrative about Sathya Sai Baba, in his critical condition of ‘living death’, took an incomprehensible and grotesque twist in that the Sai Trust discussed openly the possibility of burying Sai Baba alive! This primitive and superstitious practice from past ages in India, known as ‘sajeeva samadhi´ was eventually rejected by the Trust because of the furore it would cause. Its legality is also questionable, even though precedents exist in India! By some estimates the value of assets of the Sathya Sai Central Trust of up to 8 or 9 billion dollars (Wikipedia states the various estimates: “Sathya Sai Baba founded a large number of schools and colleges, hospitals, and other charitable institutions in India and abroad, the total value of which is usually estimated at Rs. 40,000 crore (US$ 9 billion). However, estimates as high as 1.4 trillion rupees (about US$ 31.5bn) have also been made.”. Relatives of the Sathya Sai Baba claims to a share of the assets and do not want the right to dispose of this property to be solely in charge of the Trust. There was a series of meetings between family members and members of the board of the Fund, but there was no agreement. 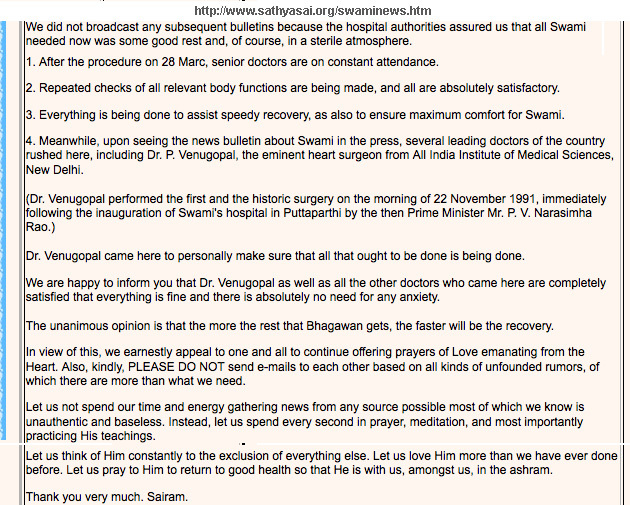 The health status of Sathya Sai Baba deteriorated. Cardiac work is supported by an electro-stimulator (pacemaker). It is connected to a respirator and an artificial kidney and artificial liver. In the body, there are pockets of infection. Since the Sathya Sai Baba publicly stated that he would live to 92/3, 94 and 96 years, many devotees expect that he will recover. “He’s a god. He will overcome this stage and will once again give darshan. It is my belief. You can not believe, and I believe” – says the secretary of the Foundation of Sathya Sai Baba Mr. K. Chakravarthi.” (On this day before the announcement of his death, and knowing the dishonesty of some Trustees, I posted a prediction that it would fall on the next day because it was Easter Sunday and also devotee Sachin Tendulkar´s birthday!, see here Sathya Sai Baba to be ‘resurrected’ on Easter Sunday?? Posted by robertpriddy on Saturday April 3rd 201! Starting around 11 am, an important meeting of the Trust was held with members of the Government of Andhra Pradesh and family members. Only about 20 people were present and discussed the proposal that Sai Baba´s nephew Ratnakara, and the current board of directors of the Trust should divide it into two parts: the ashram, and the medical and educational projects. Negotiations were unsuccessful and deadlock followed. The death of Sathya Sai Baba was officially announced. He died aged 84 (i.e. in his 85th year) at 7:40 am local time. The cause of death was given as cardio-respiratory failure. Post-mortem examination was not made and no official death certificate is known to exist. It remains unclear how the death occurred, whether brain death was declared, for the system of artificial life support must have been turned off at some point. By whom – and whether Easter Sunday was in that case cynically chosen – is anyone´s speculation since this crucial point was most carefully avoided by all concerned, including the ambivalent and semi-worshipping Indian press! If one views all this in the context of the casket being enquired about already on or about the 29th of March…frantically ordered by 3 am, through multiple phone calls ( April 4th/5th), and that the so-called “sanjeeva samadhi” (burial alive) reports surfaced by April 20th, the sequence is logically consistent with the strong suspicion that Sai Baba was already dead. Dr. Safaya of the Sathya Sai Super-speciality Hospital, Puttaparthi, signed Sathya Sai Baba’s death certificate but it was not legally valid Dr. Safaya resigned his post almost immediately, his suggestion was that he was forced into a role which he could not accept. The Dutch academic, Chris Dokter, posted this information on his website ‘Mind Your Mind’ under The Case of the Missing Death Certificate. The certificate above was published widely in India on 24/4/2011. The Indian media company NDTV posted a copy of it and a comment was made on this by Dr. Soumitra Mukhopadhyaya (24-04-2011). See also a full account here. This entry was posted on October 10, 2015 at 9:10 am	and is filed under Sathya Sai Baba. Tagged: Dr. Safaya, sathyasaiorg, swaminews. You can follow any responses to this entry through the RSS 2.0 feed. You can leave a response, or trackback from your own site.